Yesterday on the Culture Builds Florida blog we spotlighted 2013’s musical nominees for the Florida Artists Hall of Fame. Today we will be featuring our visual arts nominees, who represent a variety of styles and backgrounds. Their work is exhibited throughout Florida and beyond. We encourage you to seek out their work and view it for yourself. In March it might be one of the following painters, photographers or sculptors who is awarded “La Florida” and added to the wall of the Florida Artists Hall of Fame in the Capitol. 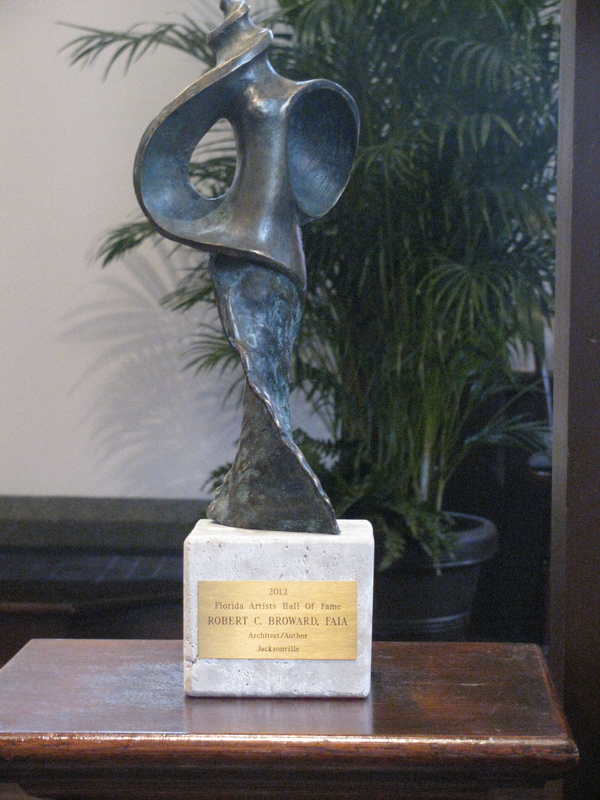 The sculpture “La Florida” was created by Enzo Torcoletti and is awarded to all Florida Artists Hall of Fame inductees. This photo is from Robert C. Broward’s induction last year. Romero Britto is a world-renowned Brazilian-American Neo-Pop artist, painter, serigrapher, and sculptor. He has lived in Miami since 1989. He combines elements of cubism, pop art and graffiti painting in his work, attracting collaborations with many corporate brands. His art has been exhibited in galleries and museums in over 100 countries. An outspoken and energetic philanthropist, Mr. Britto often serves as a benefactor to many varied causes. He has donated art and resources to over 250 charitable organizations. He serves on several boards of directors, including Best Buddies International, and St. Jude’s Children’s Research Hospital. He was recently named a founding inaugural benefactor of Harvard’s International Negotiation Program for peaceful conflict resolution. His desire to use his art to bring the international community together in peace informs his life. Mr. Britto has spoken about art and humanity at the World Economic Forum in Davos, and at many schools and institutions. His website can be found at www.britto.com. Ms. Scherley Busch is one of Florida’s most respected photographers and photographic portrait artists, with exhibitions statewide and work held in private and public collections. Her work is published nationally in books and magazines. The artist is also known for unique photographic interpretations of landscapes through her hand-tinted “Dreamscapes” of Florida scenes. She is particularly appreciated for images documenting the Florida Women’s Hall of Fame and photographs of many of the state’s women of achievement. Her artistic portraits of prominent Florida artists and leaders in many fields are widely appreciated. They celebrate the essence of extraordinary people who have transcended difficult boundaries in their lives to achieve success in arts, government, business and philanthropic endeavors. Ms. Busch often gives of her time to instruct young artists in her photographic technique, which seeks to find the subject in time and space in order to document the image at its most profound moment. You can visit her website at www.scherleybuschphotography.com. Jennifer Chaparro creating a piece of chalk art. Photo by Craig C. Houdeshell. Image courtesy/used by permission of Jennifer Chaparro. Jennifer Nichols was born into an artistic family in Michigan and grew up in California before moving to Ohio. She pursued degrees and experience in painting and design while working in advertising and raising her two daughters. In Ohio, Ms. Chaparro served the Dayton Visual Arts Center, serving as their president and as a board member and contributing artist. In 1999, she moved to North Palm Beach with her daughters, and began participating in the Street Painting Festival at Lake Worth, the largest street painting event in the United States. This event launched Ms. Chaparro’s art career. She specializes in large 10′ x 10′ works, usually featuring the relationship between women and children. Now a well-known participant in the European street painter tradition, she received her Semplice Professional Certification in 2009, her Qualificato Certification in 2010, and her Maestro Certification in 2011. She frequently supports local community events with her participation. 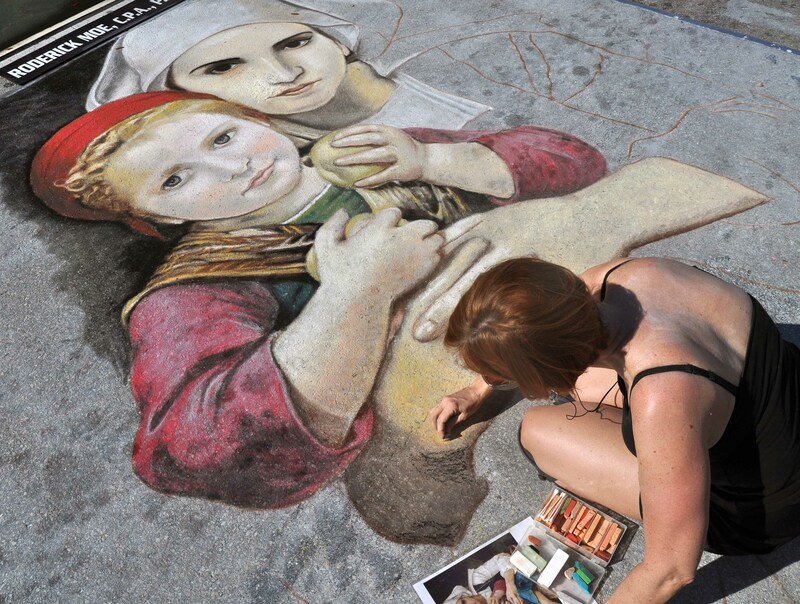 Learn more about her street painting and chalk art at http://www.amazingstreetpainting.com. 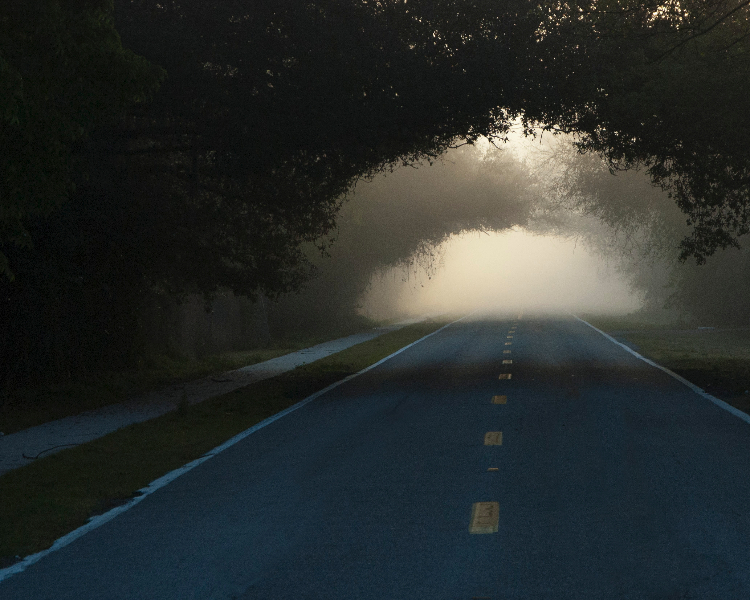 “Mystic Road Odessa, Florida” by Gregory Colvin. Image courtesy/used by permission of Gregory Colvin. Greg Colvin is a photographer-artist whose inspiration is found in the natural world. He uses the camera as a paintbrush, “…recreating visual sensations to share with others.” Mr. Colvin spends much of his time teaching others; also publishing many instructional articles. His images have been shown in galleries, juried exhibitions, outdoor art shows, schools and libraries. His work is included in the Tampa General Hospital permanent collection and Hilton Hotels. He was admitted into the Naples Museum of Art “Florida Contemporary Exhibit” in 2009. This year, he was commissioned by the federal government’s FCCPAC Art Project to create seven pieces for a new public building in downtown Orlando. He was also recently accepted into the Manhattan Arts International “Celebrating the Healing Power of Arts” juried exhibition in New York City. You can see more examples of his many photographs at his personal website. Visual artist Bruce Harold Cook creates colorful sculptures of native wildlife and whimsical outdoor scenes using natural materials, including wood and glass, which represent his vision of the ecological balance of Florida. His work is represented in Florida State Parks visitor centers, in galleries and private collections, and in public and corporate buildings. Mr. Cook is a frequent volunteer at many community art events. He has a particular interest in art therapy, devoting his time to serving the communities of vocational rehabilitation, juvenile justice, Hospice, and the Hibiscus Children’s Foundation. He is a five-year member teaching artist of the VSA Florida program for adults with disabilities. Mr. Cook pursues every occasion to help those with disabilities to use the arts as he does—as a positive way to overcome personal limitations. A visual artist known for her vivid connection to the inspirations of Nature, Ms. Heaton’s acclaimed watercolors and oils have won numerous awards and have appeared in many national and international shows and galleries. Her Florida landscapes and animal paintings hang in public and private collections, and have been featured at museums around the United States and the world. She has worked to gain wider recognition for Florida’s animal artists, gathering those artists in exhibits to express concern and raise funds for endangered Florida wildlife. Ms. Heaton is known for giving much of her time and artwork to advance the missions of community organizations such as the Friends of John D. MacArthur State Park, Palm Beach County Nature Foundation, Florida Watercolor Society, and the Society of Animal Artists. Ms. Neaton’s website can be found at www.paintingsofwildlife.com. As a renowned fine arts teaching professor at the Florida State University for 27 years, Ralph Hurst found great joy in assisting young artists develop their talents. Highlighting his esteemed FSU career were faculty grants allowing him to have a studio at the campus in Florence, Italy to continue his sculptural carving in alabaster and marble. The creator of thousands of artworks in his lifetime, his contributions to the arts community of Tallahassee continue to play a major role in the education of future artists. He and his wife established the Ralph and Jean Hurst Art Collection at Tallahassee Community College. The gallery serves as a permanent education tool for students at the college. The artist also played a vital role in founding the LeMoyne Center for the Visual Arts. His commissioned works can be seen at the Claude Pepper Center. Hurst’s sculptures and multimedia works are exhibited internationally, and in many museums and major galleries, including the Society of the Four Arts in Palm Beach, Florida Craftsmen in St. Petersburg, the Harmon Gallery in Naples, the High Museum in Atlanta, and the Metropolitan Museum of Art in New York. At www.theralphhurstgallery.com you can view an interactive version of the Ralph Hurst Gallery at Tallahassee Community College. A popular and award-winning oil painter of images of the Indian River Lagoon and natural Florida scenes, Mr. Kelly was a student of landscape artist A. E. “Bean” Backus. He is a retired Fort Pierce firefighter, with a penchant for using art as a vehicle to compel people to better understand and respect the ecological environment of the Treasure Coast Region where he lives. His book, Treasured Waters, illuminates the beauty and history of the Indian River area. He frequently donates his time to teach art to seniors and young art students, and lends support to many local community efforts to preserve the natural environment. In 2007, he received the Florida Senate Medallion of Excellence commemorating his artistic visions of Florida’s natural beauty. His work can be seen in galleries throughout Florida, museums, and public buildings in the Treasure Coast Region. 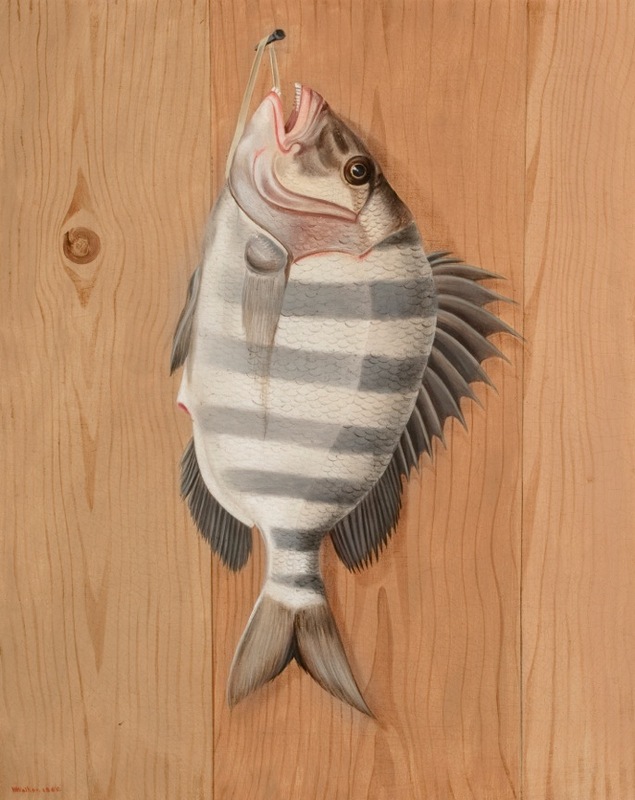 You can see more examples of Mr. Kelly’s work and order his book at Treasured Waters. A world-renowned Florida wildlife and landscape painter, watercolorist, art teacher and animal rights advocate, Mr. Seerey-Lester is widely known for his up-close images of the Florida Panther, loggerhead turtles, wetland birds and other wildlife in natural habitat settings. He personally assists and contributes to local wildlife conservation on the Gulf Coast, particularly the protection of sea turtles and shore birds. The artist is very active in the Venice arts community as an art teacher and arts community fundraiser, greatly impacting the quality of arts instruction and arts support in that region. His worldwide reputation is based upon numerous national and international awards for his images depicting the forces of nature at work. The author of many of the books he illustrates, Mr. Seerey-Lester’s newest book of paintings and nonfiction writing, Legends of the Hunt, was published in 2010. View John’s art as well as art by Suzie Seerey-Lester at www.seerey-lester.com. Image courtesy/used by permission of Jimmy Stovall. Jimmy Stovall’s paintings reflect his interest in preserving the Florida he remembers as a young man. He is the last artist personally taught the Highwaymen painting style in Fort Pierce by Alfred Hair. Following his distress concerning Hair’s untimely death, Mr. Stovall temporarily gave up painting and moved to Tampa, and then migrated to Miami to work, where he began to paint again. Highwayman Artist Mary Ann Carroll contacted him in later years about photographer/author Gary Monroe, who was working on a book about the scattered group of artists. But the aftermath of Hurricane Andrew rendered the artist unreachable for Monroe’s early book interviews. Twenty-six of the Highwaymen were featured in The Highwaymen (University Press of Florida, 2001). Soon after that, Mr. Stovall returned to fulltime painting and to his home in Fort Pierce, where he still lives and works. Twenty-six Highwaymen were honored by induction into the Florida Artists Hall of Fame in 2004. View his work at www.thelegendaryhighwaymenartgallery.com. A regional genre painter of the Post-Reconstruction South, the artist William Aiken Walker dedicated his life to exploring Florida and the East Coast. An early iconoclastic figure, he was the only artist of that time to focus his talent on recording the Post-Civil War life of emancipated slaves, and the rapidly changing culture of Florida. Walker was a solitary wanderer who spent many years alone exploring the backwoods, swamps, rivers and bays of the state, drawing and painting what he saw, which include the first and most comprehensive collection of Florida native fish images of the time. He roamed frontier Florida documenting the flora and fauna, town scenes, fishing communities, railroad construction, and early homesteads around him. Prior to the Civil War, he briefly worked in Cuba as a photographer then served as a cartographer in the Confederate Army before beginning his long artistic exploration of Florida, where he remained until his death in 1921. The Flagler Museum and the Museum of Florida History have collected rare series’ of Walker paintings. The book William Aiken Walker: In Florida (2003) is available from Eaton Fine Art. Florida’s most important Nineteenth Century woman artist, and one of the earliest and greatest publicists of our state’s image as a “tropical paradise,” Laura Woodward changed the course of history in Florida by influencing Henry Flagler’s choice of resort location with her ideas and naturalistic paintings of the Palm Beach area. She enlivened awareness about Florida before the time of color photography by exhibiting her works widely, thus enticing tourism to the state. Prior to moving to Florida, Ms. Woodward was an acclaimed Hudson River School Artist and among the most distinguished of American women artists painting at that time. She was also one of the very first professional artists to paint natural plein air images in the wild areas of the Everglades. Her important role in the development of the state is now taught in history classes at Florida colleges. Laura Woodward’s inspired dedication to the Florida landscape, and her legacy as a tireless advocate for women artists in this country, survive her. You can learn more about her and see some examples of her art at the Edward and Deborah Pollack Fine Art website. 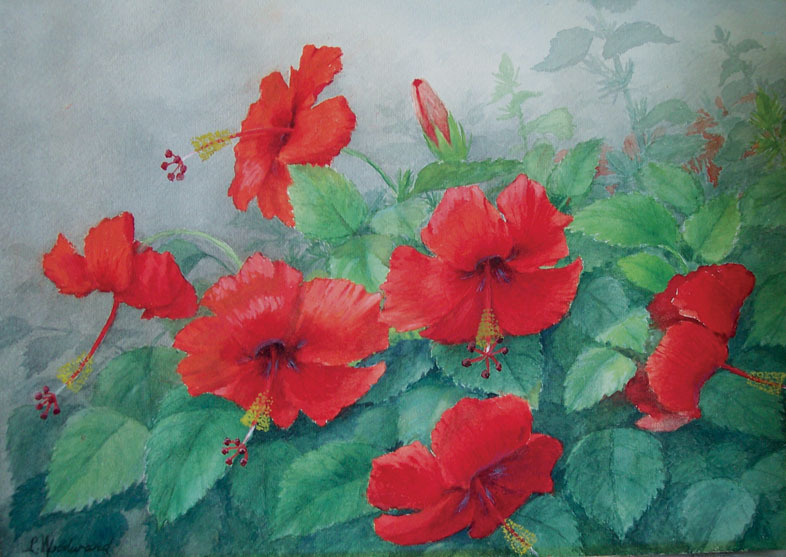 Laura Woodward, “Red Hibiscus,” watercolor, collection of Edward and Deborah Pollack. Image courtesy/used by permission of Edward and Deborah Pollack. Read more about the program and all previous inductees at the Division of Cultural Affairs Artists Hall of Fame page. Check back tomorrow as we profile the remaining 2013 Florida Artists Hall of Fame nominees. This entry was posted in Florida Division of Cultural Affairs, Spotlight On and tagged Bruce Harold Cook, Florida Artists Hall of Fame, florida division of cultural affairs, Greg Colvin, Janet Heaton, Jennifer Chaparro, Jimmy Stovall, John Seerey-Lester, Laura Woodward, Ralph Hurst, Richard Kelly, Romero Britto, Scherley Busch, William Aiken Walker by culturebuildsflorida. Bookmark the permalink. Awesome paintings …. nice sharing….